Fundraiser by Davy Rogers : Help Coach Reumante get to NXN w/ Eldad and Obsaa! Help Coach Reumante get to NXN w/ Eldad and Obsaa! 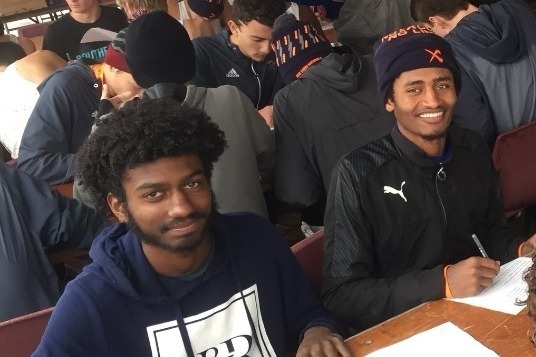 Today, at the Nike Southeast Regional Cross Country Championships, Eldad Mulugeta and Obsaa Feda finished 4th and 8th, respectively, to earn their ticket to the Nike National Championship in Portland, Oregon. It was a phenomenal race by both young men and clearly the result of hard work and dediction. While Nike pays to fly the athletes out to Oregon, they do not do the same for the coaches. Coach Giovanni Reumante has played an integral role in the success of both of these athletes, as runners and as young men. His dedication to all of his athletes is undeniable. Lets help get Coach Reumante out to Portland with Eldad and Obsaa! Any amount will help. Donations will go towards airfare, hotel, car rental and food. Thank you all for your support! Thank you to everyone that helped make this trip a possibility for Coach Reumante! It is truly appreciated and I know that Gio and the boys are ready to go! Unbelievable show of support for Coach Reumante and the boys from Northwood! I promise you have all helped make a dream come true for Gio!